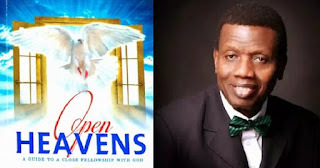 Open Heaven [2 June 2018] This is my Story - Open Heavens Daily Devotional Messages, By Pastor E.A Adeboye. However, at the appointed time, God Almighty made a way for all of mankind to change this story. He made unlimited grace available to us. This grace is unlimited because it is available to all who will receive it to change their story. It was this grace that changed the story of people like Apostle Paul who we read about in our Bible text today. Beloved, your story can change as well if you will give your life to Christ and completely yield to His Lordship. If a chief among sinners like Saul to Tarsus could become Apostle Paul, I assure you that your own story will also change if you believe in the work of redemption that Christ came to offer us. After you accept this work of redemption, all other unpleasant stories about you like joblessness, poverty, sickness, handicapping situations, demonic oppression and eternal death will change. You will have a new story to tell, like the man who was born blind but whose story changed in John 9:25. After God has changed your story, be willing to share it with others, just as Paul and the man born blind did. When you do this, God will continue to give you new pleasant stories to share to the glory of His Holy Name. What is your story today?